I intuitively work with love, light and energy, offering healing products in the forms of healing jewellery (with and without gemstones), gemstone gifts and art greeting cards, to help you attain a healthy balance of physical, mental, emotional and spiritual well-being. There are many different ways of using gemstones. In fact, did you know that wearing gemstones is actually one of the most effective ways to use them for healing? I try to offer as many different options as possible -- whether it be wearing a piece of gemstone healing jewellery; having a gemstone charm to attach to a belt; using a gemstone keyring; placing a gemstone heart on your bedside or under your pillow; or carrying a gemstone angel in your pocket -- so that you can comfortably know that you are receiving the healing you need in the way that is right for you .... and if you want to give something to someone else, why not choose a healing art card to give with your gift? 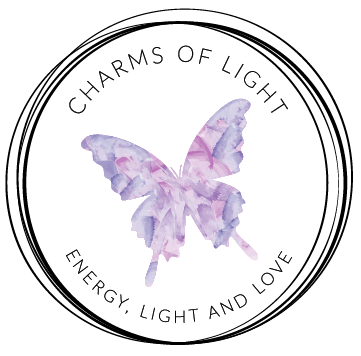 All healing products from Charms of Light have been created with love and healing intentions. Each piece is charged with Reiki energy to enhance the natural healing energies of the semi precious gemstones used. The combination of healing energies in the gemstones and the channeled energy of Reiki, enhance and compliment each other beautifully. They are all beautiful "Charms of Light"! Even my healing art cards are infused with Reiki, love and an intent to heal. All gemstones are alive with wonderfully positive energies which will provide you with feelings of love and well-being. All healing jewellery and gifts are created with natural gemstones, therefore each one is a unique piece — one of a kind in colour, shape and design. If you see something you like, purchase it today. Owing to the natural differences in all gemstones, some items may differ slightly from the photos shown.